2012 Update: While the review below is for an all natural ice cream, I just went to check on this flavor and realized it has been converted to a Frozen Dairy Dessert. Why would they ruin it like that? I think the idea is that this is now the base for the Klondike Krunch BLAST flavor. 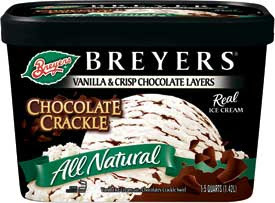 On tonight's agenda was to finally 'crack' open a container of Breyer's All Natural Chocolate Crackle. It's one of their newer flavors and it has been calling to me since it came out even though I wasn't really sure what to expect. The first thing that struck me on the first couples bites was the Breyer's Vanilla flavor. If you ask my belly, it remembers a time when it was much more flavorful. Now the vanilla is very mild, almost as if frost burn has stolen it's bite (I noticed this on their cookie dough as well). I took a few more bites and started getting into the ripple. Memories were triggering and at first I was reminiscing about one of those Nestle Crunch Ice Cream bars, but the chocolate ripple is thinner than that. Then it hit me, this tastes just like a Klondike Bar (original flavor). It's uncanny. I just checked their website, and Breyers and Klondike are both owned by Unilever. So we should definitely be talking about all the same ingredients in both treats. The Crown Hill Grocery Outlet (SEATTLE) just got some of these. $2.99 for a half gallon. Gotta love closeout prices. MAS, that's just scary!! what's the date on the bottom?? and now it's at the lake city grocery outlet, $0.99 for the half gallon. might want to check the expiration date on the bottom of that container!